The 65.4 metre motor yacht La Sultana has been listed for sale by Camper & Nicholsons and has an interesting past. Built in steel by Bulgarian yard Giorgi Dmitrov and delivered in 1962, she originally served as a Black Sea passenger ferry. In 1970 however, the Soviet navy commandeered her for use as a spy ship. Ostensibly, she served as an environmental research ship in the North Atlantic Ocean on behalf of the International Organisation of Telecommunications, but behind the scenes she was charged with spying on the Mediterranean naval fleets of the United States and Britain. She was rescued from this tawdry role in 2007 by the luxury hotel group La Sultana which converted her into a luxurious charter superyacht. Early in 2015 she underwent a further complete rebuild, being stripped throughout and relaunched, boasting a new interior mixing Art Deco styles and oriental influences to great effect. Accommodation is now for 12 guests in seven cabins, all with luxurious en suite bathrooms finished in marble and onyx. In addition, there are quarters for 17 crew. Special features of this yacht for sale include a heli-pad, an indoor freshwater swimming pool with direct access to the sea via a new beach club and a vast upper deck with room to entertain up to 150 guests. Extras like a tender and a Mini Moke car (remember them?) are included. A single, powerful Mitsubishi 1,060hp engine gives her a cruising speed of 10 knots and a range of 5,500 nautical miles. 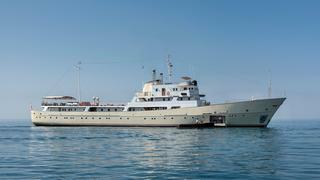 La Sultana is asking €22.5 million.